Mirror, mirror - two chalk paint projects - Lovely Etc. 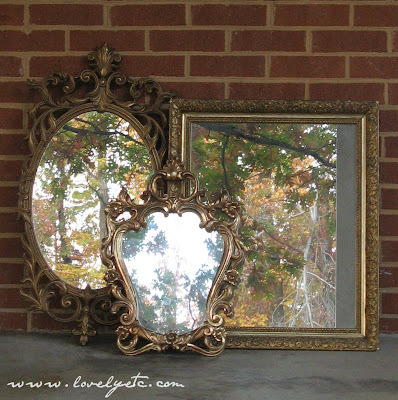 I have two great mirror transformations to share today. 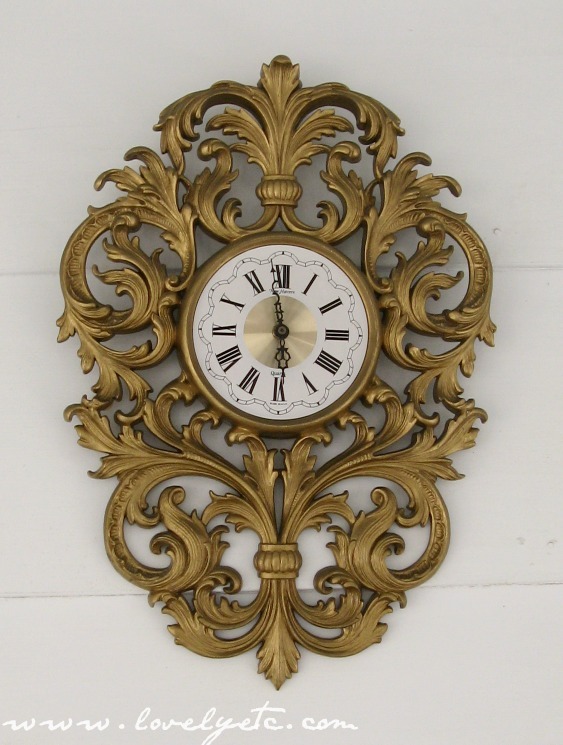 The first actually started out as a clock surrounded by swirls and flourishes. 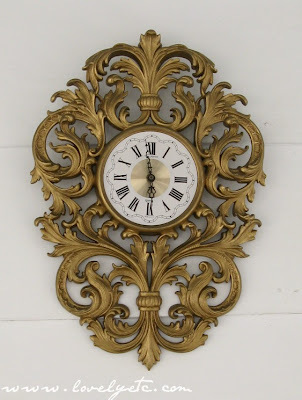 As soon as I saw it, I thought of the two clocks I repurposed into mirrors this summer. At first I wasn’t sure about this color – it was a bit darker than I expected. But I think it was absolutely perfect for this transformation. It compliments the Frenchy curves perfectly. The second mirror was a mirror all along. I started out with the small Snow White mirror in the front of this picture. This mirror was pretty old and HEAVY. 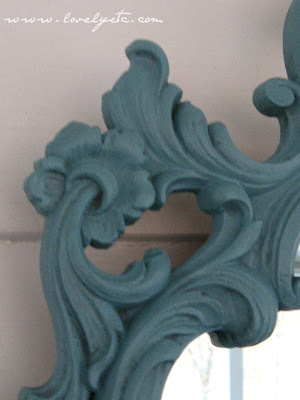 But, the gold finish still wasn’t doing it for me so I turned to another chalk paint color – Provence. I painted a base coat of Provence and then dry-brushed on a Graphite-Provence mixture to give it some depth. Oh how I love them both. 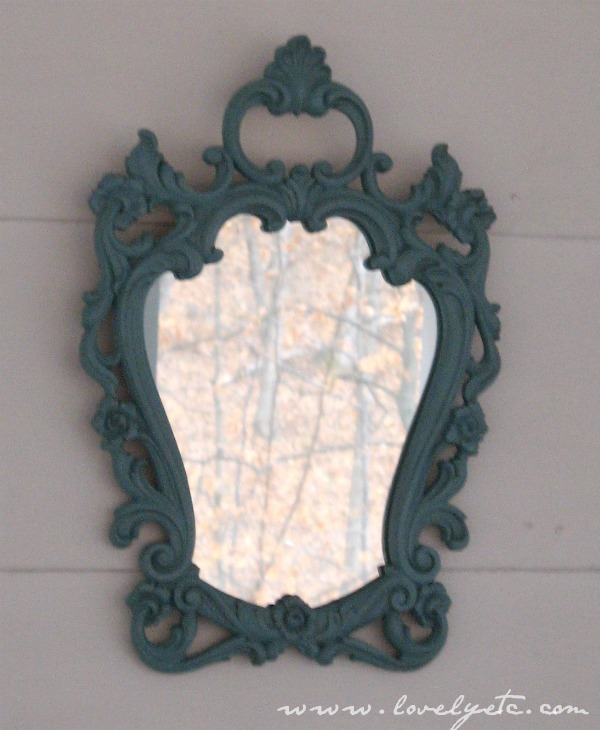 But both of these sweet mirrors are for sale in my wee shop. How awesome would a whole wall of these beauties be – maybe in a foyer or a formal dining room. I may just have to start collecting some for myself! Now to get busy finishing my Christmas shopping! These are beautiful. I love the clock to mirror transformation. So very clever. Great job! Oh..and I am one of your newest followers. I can’t wait to see more! 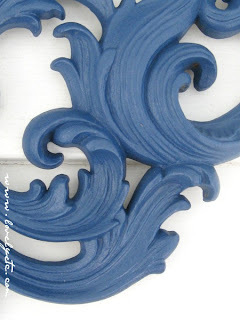 These are wonderful.So nice to meet you just found your lovely blog and so happy I did. I have enjoyed looking around and I’m now following you, if you find a spare minute hope you visit me sometime and follow back so nice to meet new friends. Sending you special wishes for a very Merry Christmas Day and look forward to keeping in touch in 2012. Fantastic! I love the finished product! This is a great idea, changing the clock to a mirror. It looks so pretty. I wonder where you found the mirror to fit. I am joining your followers. Hope you stop by and see if you’d like to join mine. I am so in love with those pieces!! 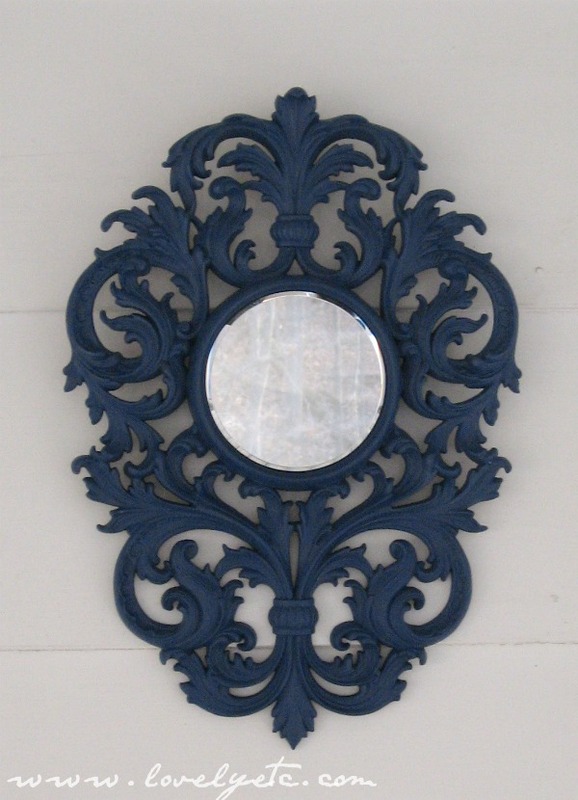 How amazing to turn that old clock into a chic mirror!! Awesome job on both! I would love for you to come link up today over at Passionatelyperfect.com!! Your newest follower! Wonderful ideas! Please come share more great ideas at emosaicideas.com on out blog carnival!